The end of strawberry season is always a bit sad for us. During the season we eat strawberries almost every day and the boys can’t get enough of those brilliant red berries, often sneaking some that I’ve set aside for desserts. I’ll find leafy green tops scattered around the kitchen counters and table like evidence left behind by squirrels, and boys with sticky red fingers and faces emphatically proclaiming that they did not eat the strawberries. I can hardly blame them for sneaking into the stash since I do it, too. I paired the last of the strawberries with more of our homegrown rhubarb in a frozen yogurt using Greek yogurt, and the combination was just perfect. The tangy Greek yogurt, tart rhubarb, and sweet strawberries are a match made in dessert heaven, if there is such a place. And to make it even better, this is drop dead easy to make. So whether you are enjoying the last of your strawberries or are just beginning to enjoy fresh local strawberries, find some rhubarb and Greek yogurt and give it a try. The Greek yogurt base is flavored with rhubarb puree, which you make by cooking down the rhubarb in a little water and sugar. Just cook until it’s very soft, then mash with a fork, or blend if it’s stringy. Then cool and whisk in the yogurt mixture. Make sure you chill the rhubarb yogurt base for 4 to 12 hours before churning so the rhubarb flavor has time to permeate the mixture. Add the strawberry chunks during the last two minutes of churning to keep them chunky and not mushy. 1. RHUBARB PUREE: Cook rhubarb chunks in the small saucepan with sugar and water until the rhubarb is fork soft, about 20 minutes. Mash with a fork and allow to cool completely. If the rhubarb is stringy, you can puree it with an immersion blender or in a jar blender. 2. In the plastic bowl, whisk together the Greek yogurt, half & half, granulated sugar, and vanilla extract. Stir in the rhubarb puree until it’s thoroughly mixed in. Cover and chill in the refrigerator at least 4 hours to overnight. 3. About 30 minutes before churning, put the yogurt mixture in the freezer to get it really cold. Churn in your ice cream freezer according to the manufacturer’s directions. Add the strawberry chunks a little at a time during the last 2 minutes of churning. Scoop the frozen yogurt into the plastic freezer container, press a piece of plastic wrap over the yogurt, and put the lid on. Freeze until firm, at least 2 hours, before serving. OMG! Do you know how much I love rhubarb, especially strawberry and rhubarb! The thought of both of them together is positively divine. Thank you so much for this recipe. As soon as Nova Scotia’s strawberries become ripe (1-2 wk), this is one recipe I’ll be sure to try. I’m so glad I saw this on tastespotting!! 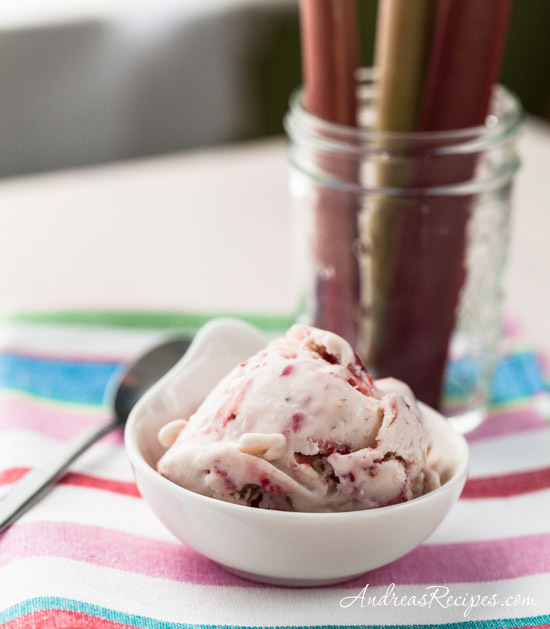 I just bought an ice cream maker and have been searching for a recipe with rhubarb and strawberries. Thanks for sharing! OMG!! I MUST TRY!! The thought of strawberries AND rhubarb sounds so yummy I might die when I combine it with greek yogurt!! !